After Hurricane Harvey hit, Texans from near and far heeded calls from law enforcement to rescue trapped neighbors, rallying kayaks, canoes and fishing boats. In Houston, Chris Ginter took it to a whole new level — with a monster truck. 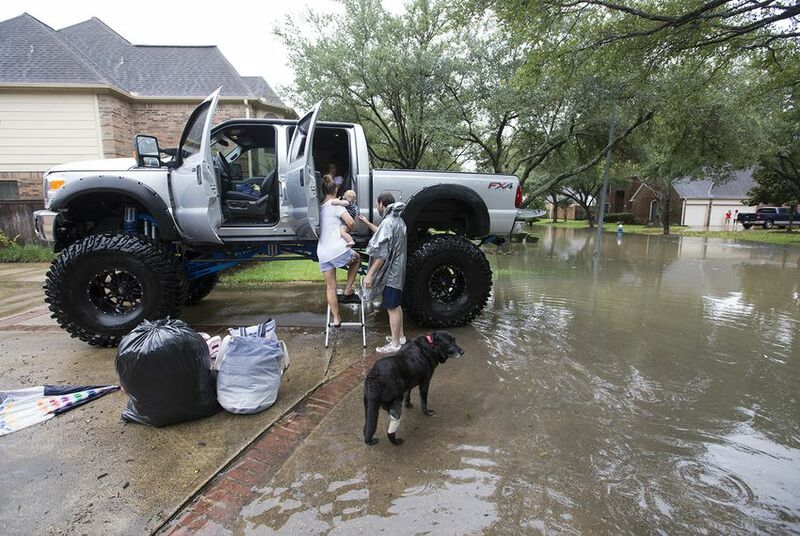 HOUSTON — Chris Ginter propelled the monster truck cautiously but purposefully through feet-high green-brown floodwaters, past submerged mansions. Families were surely still inside, huddled on the second story prepared to wait it out until the water receded. But as the water continued to rise and word of a mandatory evacuation began to spread, many had decided it was time to leave. And when they did, they turned not to law enforcement or government emergency response teams but to neighbors and citizen volunteers, people who had rallied kayaks, canoes and fishing boats and formed informal bureaucracies to organize rescue missions. Ginter’s monster truck — his brother’s, actually — was perhaps the most glorious rescue vessel of all, rivaled only by an imposing air boat that sent up an impressive spray from its fan as it accelerated back into the neighborhood to pick up more people. Other rescuers — mostly male — wolf-whistled at Ginter’s truck as it glided through the water, its 55-inch tires creating a wake that angered other rescuers in smaller watercraft. “You’re making me look bad, man!” enthused another rescuer with a slightly smaller truck. Good samaritans like Ginter, a 34-year-old commercial real estate developer and Houston native, gladly heeded the call, and by Tuesday — his third day on the job — he was clearly high on the good karma that come with repeatedly rescuing people. Strangers had gotten his cellphone number through word of mouth and called him seeking help. One caller was familiar. “Hey, mom,” said Ginter, covered in a subtle sheen of sweat, quickly informing her he had a news reporter in his truck. “I have to make mom proud,” he said, only half joking, after hanging up. There weren’t that many people left in the neighborhood who wanted to leave, Ginter said. A man standing with his family on a narrow strip of dry land between the flooded street and his garage door turned away Ginter's help, saying he was waiting for his father. Ginter had two front seat companions — his childhood friend Robert Maguire, 34, a bar manager, and his girlfriend Gina Dyrda, 28, a bartender at a steakhouse, who Maguire had brought home from Chicago three months ago. Ginter had borrowed his brother’s truck over the weekend to rescue the couple from their swamped bayou-side townhome and they had collectively decided to keep picking people up. As of Tuesday evening, they had rescued at least 50 people, said Dyrda, a petite and enthusiastic brunette with a cupcake tattoo behind her right ear. There were lots of dogs and babies, including twin girls screaming their heads off, she said. The crew had been out until 10 p.m. the night before. “Last night was sad — very sad — because we couldn’t fit everyone,” Maguire said. They had been worried about getting stuck in one of the prolific manholes whose covers had floated away, but didn’t think they had encountered one yet. They weren’t sure if even the monster tires could traverse them. They dropped their evacuees on the dry end of a boulevard abutting the neighborhood, wedged between a strip mall with a dentist's office and a Sylvia’s Enchilada Kitchen, where citizen volunteers helped evacuees down from the truck with a step ladder. Others waded out into knee-deep water to pull in smaller boats. Dozens of onlookers had gathered there by Tuesday evening, a crowd representative of the most racially and ethnically diverse major city in the U.S. — black, white, Latino, east and southeast Asian. A young South American couple casually sipped yerba mate from a stainless steel straw and mug. Many of them lived nearby and were wondering if the rising waters would eventually reach their own homes. Even though the rain had let up and nagging gray clouds had moved aside, revealing bright blue skies, water levels were continuing to rise with the U.S. Army Corps of Engineers releasing water from upstream reservoirs to help minimize flooding of homes around the detention ponds. They had upped the release rate, and were considering releasing even more into an already swollen Buffalo Bayou, which many of the homes in the neighborhood backed up to. The onlookers gawked somberly as boats arrived filled with blank-faced senior citizens — hovered over by worried adult children — and families with teary-eyed mothers. They carried rolling suitcases, trash bags stuffed with clothes and pet carriers with anxious dogs and cats. Some were calm, or maybe just in shock. Others even looked annoyed. Many had never flooded before. And many hadn't wanted to leave — even a woman caring for her father who needed dialysis the next day. Emily, who teaches math at a private Christian school and refused to give her last name, said she had been “prepared to live on beans, indefinitely,” even as water steadily flowed into her garage. The power had been out and she was all alone — her husband was on a business trip and her two kids were away at college. Then a neighbor arrived and told her there was a mandatory evacuation for the area and citizen rescuers were starting to leave the neighborhood, having scooped up almost everyone who wanted to leave. “Every house was like its own island,” Emily said. 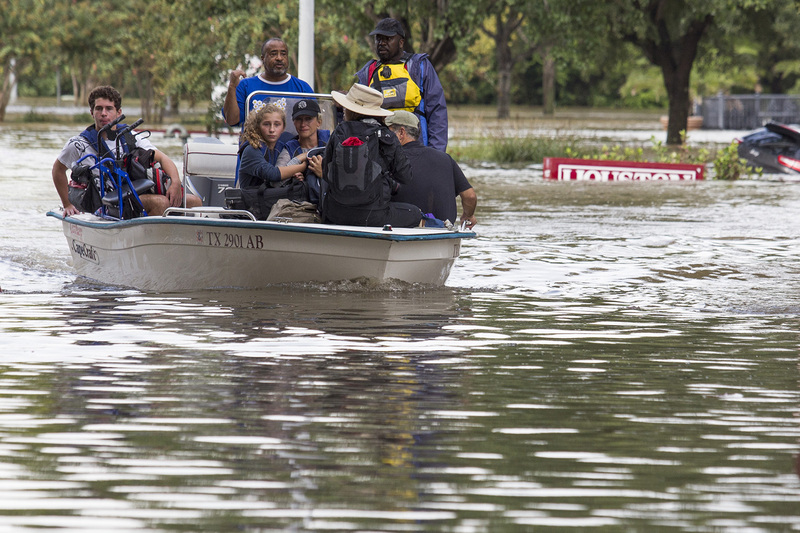 Catastrophic floods are nothing new for Houston. But the problem is going to get worse. While poorer areas were surely harder hit, the scene that played out near the posh neighborhood was evidence that Harvey did not discriminate. Still, Dyrdra said many evacuees told her they had no place to go. Surely some would hitch a ride to a hotel. Others with fewer means would head to one of several shelters that had popped up around the city. They had at least made it this far. In retrospect, it would be a good thing. 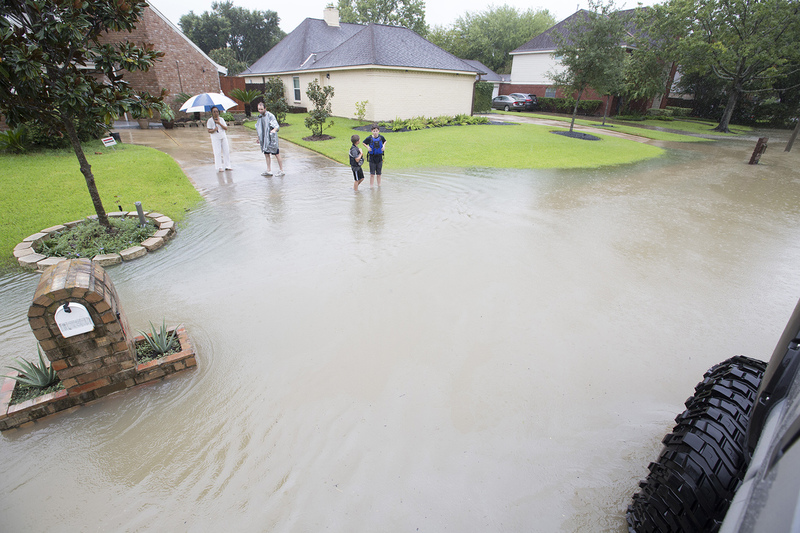 By the next day, floodwaters had risen in the neighborhood by several more feet. Neena Satija contributed to this report.